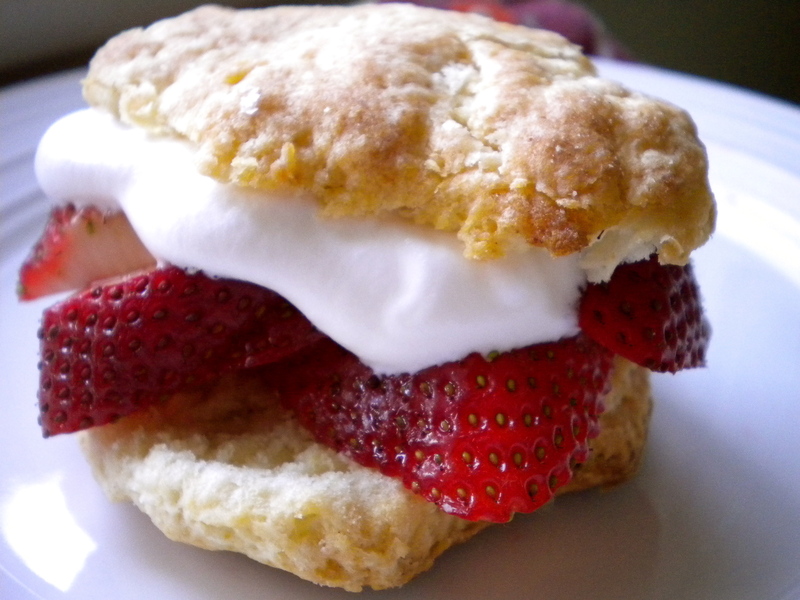 These really should be called deliciously simple strawberry shortcakes. They are a perfect spring/summer dessert because they are easy, light, seasonal and delectable. Plus, shortcakes delight all who come into contact with them because honestly, what’s not to love? They’re perfect for picnics or weeknight desserts. And, with farmers markets and local farms blooming with fresh summer fruit, I’m looking forward to experimenting with blackberry or peach shortcakes. Speaking of local foods, I would like to point out that recently my home state of North Carolina, and more specifically the triangle area, has been profiled by the New York Times for the growing local food scene there. Two great reads if you have a chance: Durham, a Tobacco Town, Turns to Local Food and Fresh Direction: A Farm-to-Table Restaurant. Go North Carolina! 1. In a food processor, pulse together the flour, sugar, salt, and baking powder for the biscuits. Cut the butter into the flour mixture, pulsing until the largest pieces of butter are the size of peas. Transfer mixture into a large bowl. 2. In a smaller bowl, use a fork to whisk together the cream, egg, and vanilla in a small bowl. Make a well in the large bowl of the flour mixture and pour the cream mixture into the center of it. Use a fork to mix until the dough is evenly moistened. The dough mixture should look shaggy. On a lightly floured surface, knead the dough with your hands to create a ball. 3. Turn the dough out onto the surface and pat or roll out until it is around 1/2-inch thick. Using a 1 1/2-inch diameter biscuit cutter (or a juice glass), cut out round biscuit shapes from the dough. Place rounds on a baking sheet, space about 1 1/2 to 2 inches apart from each other. Chill for 10 minutes in the refrigerator before baking. 4. Heat oven to 425°F. Bake biscuits on middle rack for 12 minutes, or until risen and lightly browned. Remove from oven and let cool. 1. Place the sliced strawberries in a bowl and sprinkle sugar over them. Gently mix so that the sugar coats most of the strawberries. Let sit until the sugar dissolves and the strawberries release their moisture. 1. Make sure you are starting with cream that is very cold. Use a hand mixer to whip the cream until it just begins to firm up. Sprinkle the vanilla over the cream. Continue to whip until it is thick and holds its shape. Cover with plastic wrap and keep chilled until it’s time to assemble the mini strawberry shortcakes. 1. When the biscuits have cooled to room temperature, gently break them apart or slice them in half with a knife. Place strawberry slices on each bottom, and place a dollop of whipped cream on top of the strawberries. Then place the top biscuit piece on top of the whipped cream. If you really want to go all out — drizzle some Nutella that’s been heated up. Amazing. This recipe is perfect timing for me! I just bought a beautiful carton of strawberries – I’m going to make shortcakes tonight. Thank you! I love your food blog Emily! It’s always so beautifully executed.